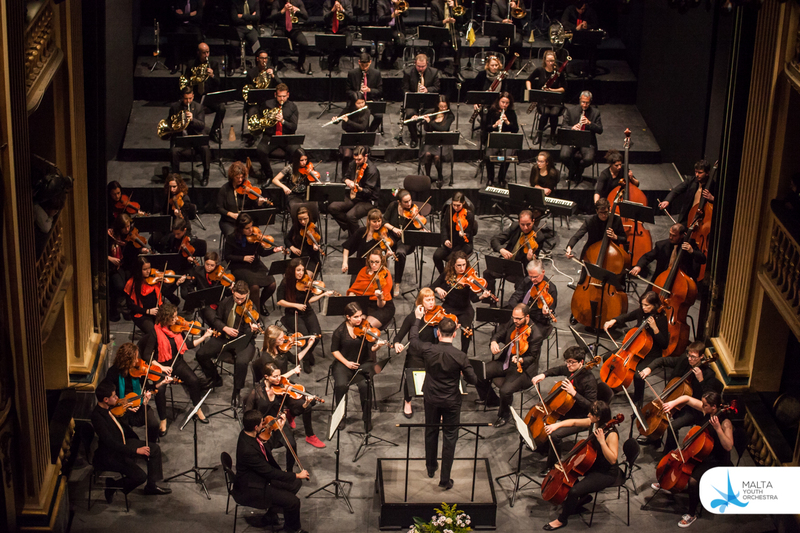 The Malta Youth Orchestra (MYO) aims to skill Malta’s talented young orchestral musicians, while giving them opportunities to develop their ambition and aspirations. Operating in collaboration with the MPO Academy, the MYO nurtures a sense of professionality in our young musicians, through regular rehearsals, workshops, masterclasses and performances with local and international music tutors. The MYO made its first public appearance in December 2004 during a concert held at the President’s Palace in Valletta under the direction of Michael Laus. Between 2011 and 2014 the MYO rehearsed regularly under the direction of conductor Joseph Vella, and has since then been working with a variety of prominent local and international conductors, including Peter Stark, Robert Hodge, Kelly Kuo and Michalis Economou. Despite being essentially a student orchestra, the MYO tackles core classical repertoire spanning several centuries and genres. The MYO has been busily engaged since its conception in various concerts including participation during Notte Bianca, Christmas concerts, bespoke performances for the Ziguzajg Festival and the highly successful MPO & MYO Concerts at Pjazza San Gorg in Valletta. MYO musicians often perform alongside musicians of the Malta Philharmonic Orchestra, fulfilling one of the MYO’s purpose of being an aspirational milestone for Malta’s young musicians, helping to nurture them into becoming the future musicians of the Malta Philharmonic Orchestra and ultimately the catalysts for our country’s cultural development. ©2019 Malta Philarmonic Orchestra · Designed & Developed by Cyberspace Solutions Ltd.